This Red Velvet Cookie Dough Dip is deliciously sweet and chocolatey, ultra thick and fudgy, and totally rich and addictive. One spoonful and you’d never believe that it’s actually good for you. Yup, I said it. This dip is GOOD FOR YOU! This Healthy Red Velvet Cookie Dough Dip is not only safe to eat raw (yup, no eggs here), but it’s all natural too (no artificial food coloring whatsoever)! Plus, it’s sugar free, high protein, whole grain, gluten free, dairy free, and vegan. Trust me, it sure doesn’t taste like it. This dip tastes like sin. PURE SIN I TELL YOU. So, if you’re in the mood for decadence without the sugar, butter, and guilt, then this Healthy Red Velvet Cookie Dough Dip is for you. It’s sweet, it’s rich, it’s full of flavor… it doesn’t taste nutritious in the slightest way possible. 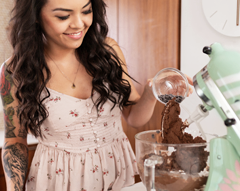 Oh, and you’re in for a real surprise when you read this recipe’s ingredient list. Can you guess the secret ingredient? 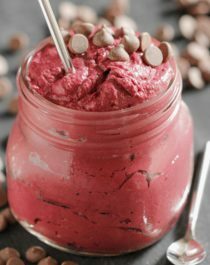 This Healthy Red Velvet Cookie Dough Dip is not only safe to eat raw (yup, no eggs here), but it's all natural too (no artificial food coloring whatsoever)! Plus, it's sugar free, high protein, whole grain, gluten free, dairy free, and vegan. In a blender or food processor (I used my Vitamix), add the beans, milk, beet puree, almond butter, vanilla paste, butter flavor, and stevia extract. Puree until completely smooth. Pour into a large bowl. To the bowl, add the protein powder, oat flour, and flaxseed. Whisk together until completely combined. Cover with plastic wrap and refrigerate overnight. Serve the next day with graham crackers, animal crackers, chocolate crackers, fresh fruit, chocolate squares, or spoons alone! Say WHHAAAAAAT?? A Red Velvet Cookie Dough Dip packed with a whopping 20g of protein, 7g of fiber, and NONE of the added sugar?? Can you believe it? There’s A VEGETABLE in our dessert! But don’t be scared, you don’t taste it. I absolutely despise the flavor of beets and I didn’t taste them one bit in this. This Healthy Red Velvet Cookie Dough Dip tastes just like any other cookie dough dip — it’s sugary sweet (but without the refined white sugar), it’s buttery rich (without the hormone-filled butter), and it’s fudgy and doughy in texture (but without the bleached white flour). I could NOT stop eating it. Whether it was with graham crackers or all by itself with my finger a spoon… it’s just SO. GOOD. Thankfully, this dip is 100% healthy and nutritious, unlike the typical unhealthy recipes floating around the internet. 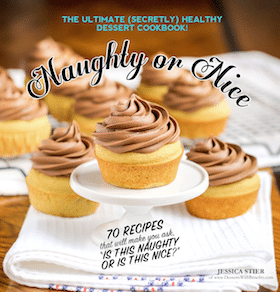 Just check out the recipe’s nutrition label above! Wow, I would not have guessed that there would be kidney beans in this recipe – it looks super tasty! TOTALLY a great improvement! 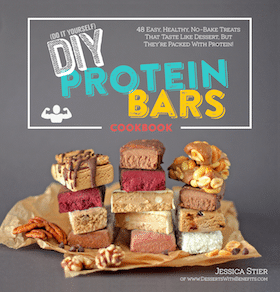 I am so excited – especially to find the protein in this! Your site is beautiful! I just got lost browsing through all your wonderful receipes! My mouth got so wet just looking at this. Awesome and unique idea. OK I have to make this. I’m a closet cookie dough monster! YUM YUM YUM. And did I mention yum?! Anyways, in all seriousness, I love the look of this recipe! Definitely something I want to try soon! How many servings does this recipe make? It looks like three or four! I’m so excited to try this recipe! One question: could sunbather/peanut butter be substituted for the almond butter? It’s the only kind that my dining hall has that I can steal.